Grilled Pork Tenderloin and Marinated Eggplant | Cosa Mangiamo? 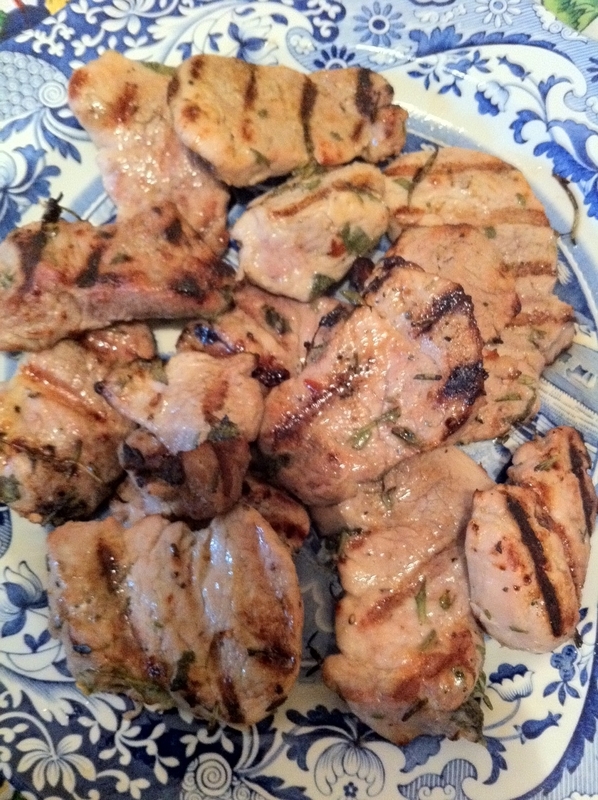 First night cooking since our trip to Italy… so I went with an easy dish- grilled pork tenderloin. I made an eggplant dish that is very popular in southern Italy, where my family is from in the Campania region. For the eggplant you basically thinly slice eggplant, salt it and cover it with a paper towel (make sure to put a paper towel between each layer of the eggplant, you dont want them all piled on top of each other). Place the eggplant in the fridge until ready to use. Heat a frying pan and just coat the pan with olive oil. Once hot, grill the eggplant until a nice golden deep brown color is achieved. You will need to keep re-coating the pan with olive oil with each batch that you cook since eggplant is like a sponge and soaks up all the oil at once. As you remove each eggplant let it rest on a paper towel-covered dish and set aside to cool. 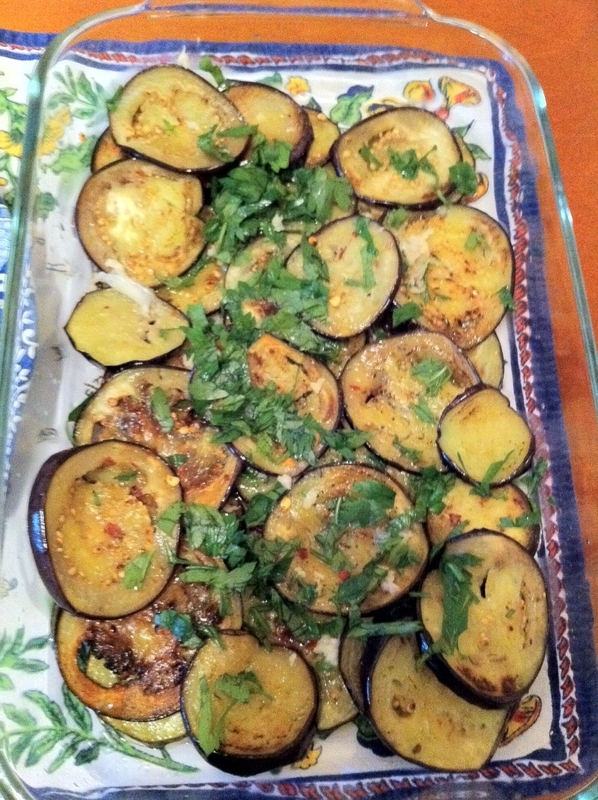 Once all the eggplant is cooked you can start the marinade… layer a level of eggplant, then add olive oil, minced garlic, white vinegar (a drizzle to coat) salt, pepper, red pepper flakes and chopped parsley and mint. Continue layering until all the eggplant is used. Set aside, the longer this sits, the better it will taste. Now for the tenderloin, super easy and super flavorful…. I like to buy a whole tenderloin and then slice it into about 1 inch thick steaks. This is something that I learned when we honeymooned in Greece on our catamaran boat ride in Santorini. Our chef cooked us lunch on the boat while we snorkeled- it was the best tasting pork loin I had ever had. So once the pork is sliced place the steaks in a Ziploc bag and add olive oil, white wine vinegar, minced garlic, sage leaves, thyme leaves, rosemary leaves, salt, pepper and red pepper flakes. Let marinate until ready to grill. The flavor from the pork brought me right back to that boat ride in Santorini…..enjoy! Thank you Alisa! I appreciate the feedback! Eggplants are one of my favorites! The smaller ones pack the most flavors! So if you get the smaller eggplans just slice vertically, rather than in rings. Click to subscribe to Cosa Mangiamo? and receive emails with new recipe ideas.